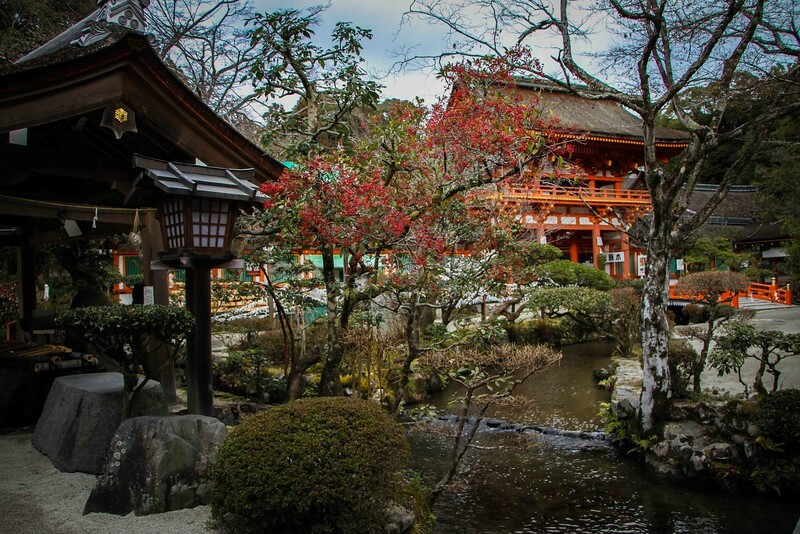 Visiting Kyoto was high on our priority list when it came to planning our Japan adventure. 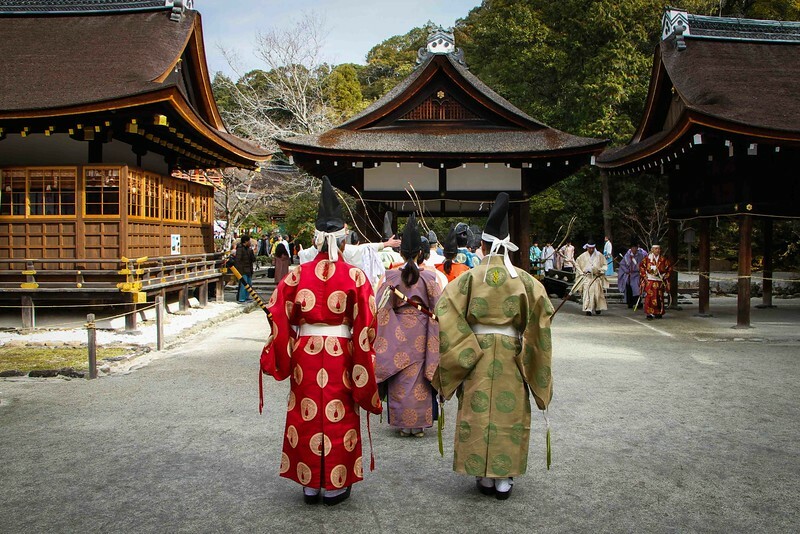 We’d admired photos of its stunning pagodas and beautiful gardens, read stories about ancient traditional tea ceremonies and were intrigued by mysterious geisha. We couldn’t wait to explore! As soon as we arrived to Kyoto, swiftly deposited by an incredibly punctual bullet train, we immediately felt a contrast to fast-paced Tokyo. It was remarkably more peaceful and had a relaxing atmosphere of calm in comparison. Ahhh. Although we’d enjoyed discovering the unique wonders of Tokyo city, the clear air and sense of tranquility was a welcome change. Since we only had a short time in Kyoto (approximately 3 days), we didn’t delay in dropping off our trusty backpacks and getting out and about to explore. Little did we know how much we would discover in just a few days! 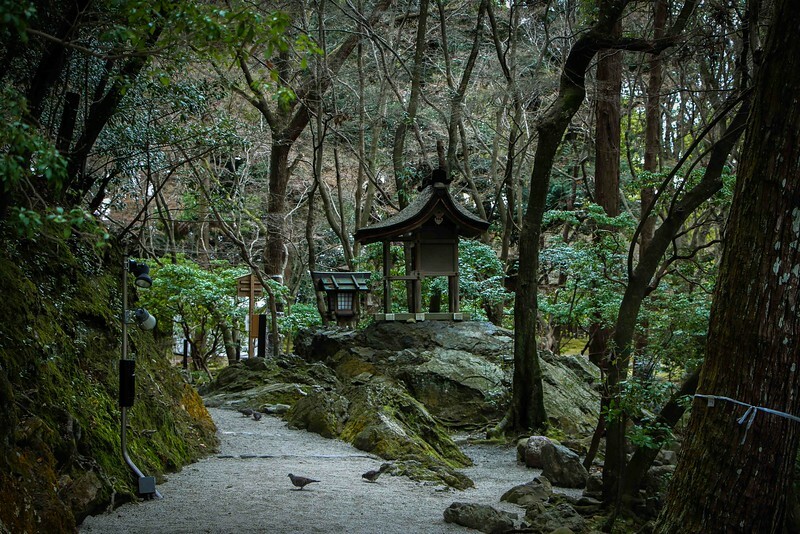 Read on for our own personal highlights and inspiring things to do in dynamic Kyoto. 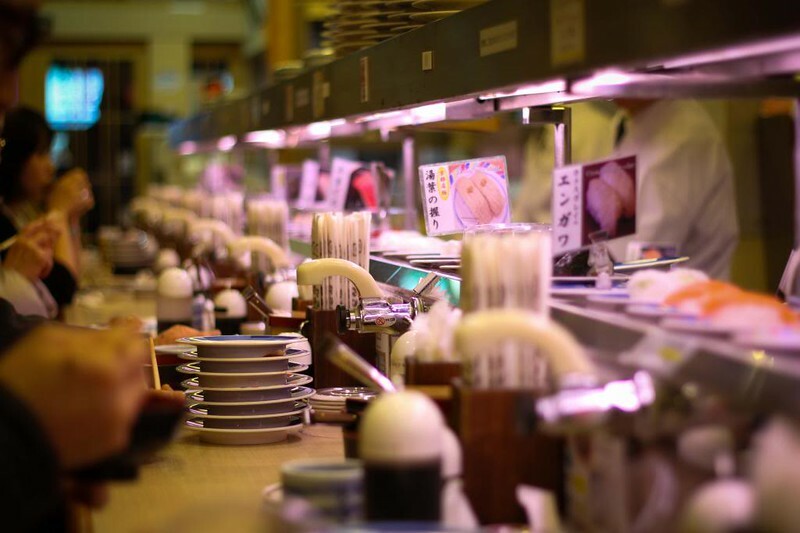 From the perfectly proportioned sushi and always on-time bullet trains, to the beautiful traditional Ryokans, meticulously laid out, the Japanese LOVE precision. 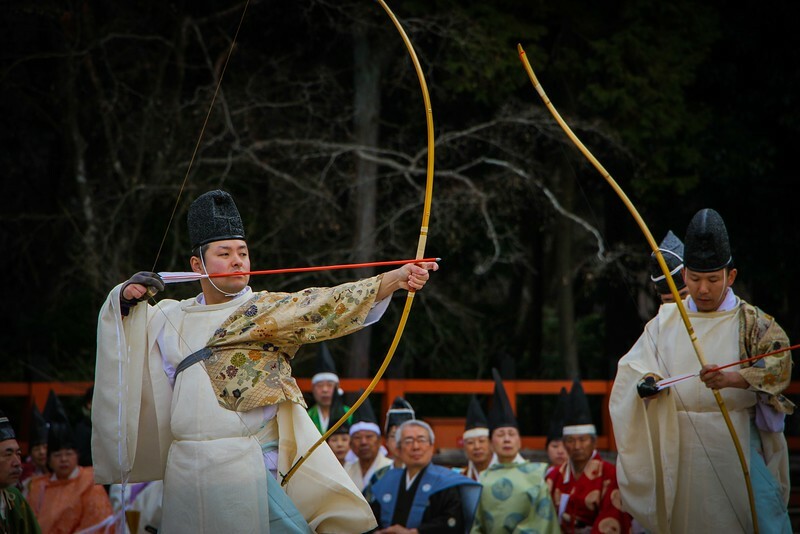 So it was no surprise when this level of precision was taken to another level at a traditional Japanese archery ceremony. 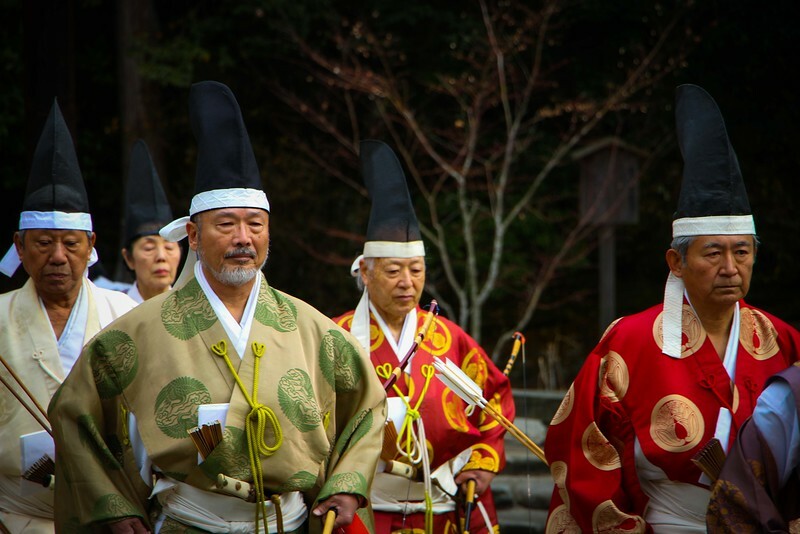 We’d just arrived in Kyoto when we heard of a special archery ceremony taking place the next morning in the North of the city, at an important temple called the ‘Kamigamo Shrine’ on the banks of the Kamo River. 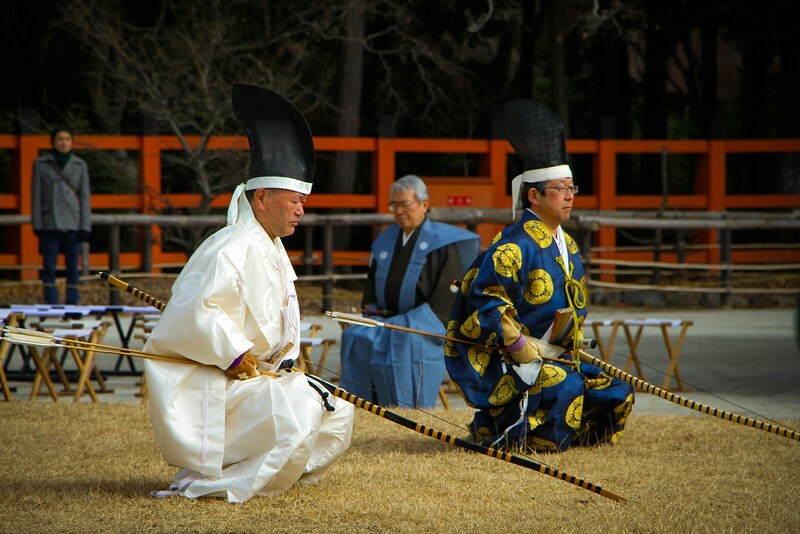 We couldn’t believe our luck in getting the opportunity to witness a traditional Samurai Archery Ceremony! However it wasn’t until we arrived that we realised how much of a big deal the ceremonies are. Television cameras and all, it was so exciting! Luckily we arrived just in time for the archery area being set up, and took up our position alongside a large crowd of spectators that were eagerly waiting for the ceremony to begin. It wasn’t long before the archers arrived. Resplendent in beautiful, colourful outfits, they slowly emerged from the temple and made their way, calmly and gracefully, to the archery area. This was to be another lesson in patience, precision and attention to detail. Slowly but surely, the archers made their way to the staging area where each archer prepared themselves with meticulous poise and grace. The detail in every movement was incredible. 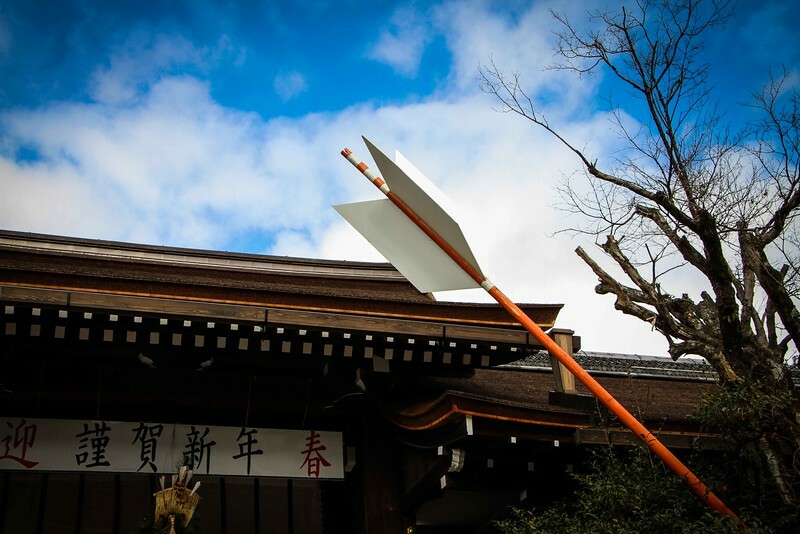 Before attending, we’d learned that the aim of Kyūdō (Japanese archery), is to train the mind and body through learning to focus on firing an arrow with the right ‘ma’ai’, or timing. We were captivated. 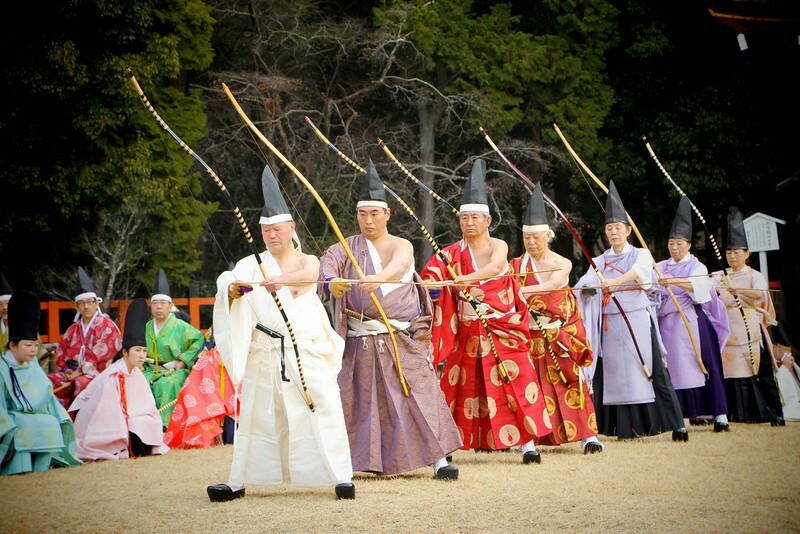 Slowly adjusting their robes to prepare for the bow and arrow and steadying themselves in preparation for action, we watched in anticipation as the arrows were presented to the archers as if they were a newborn child being given to their parents for the first time. And then it came to the firing of the arrows. The first was a pair of men, who slowly adjusted their robes and steadied themselves for the spectacle. And then, finally, the release. Letting go of the arrow, the arrow travelled majestically through the air, emitting a low gentle hum as the crowd audibly gasped and crowed, and burst into applause. We watched as other archers repeated the mantra, a meticulous routine which was in every way as interesting as the firing of the arrow. It was another fascinating insight into Japanese culture, amply demonstrating ancient rituals combined with absolute focus on detail. After the ceremony, we explored the grounds of the temple, another victory in design and organisation, as streams and trees effortlessly coexist with the temple and its inhabitants. 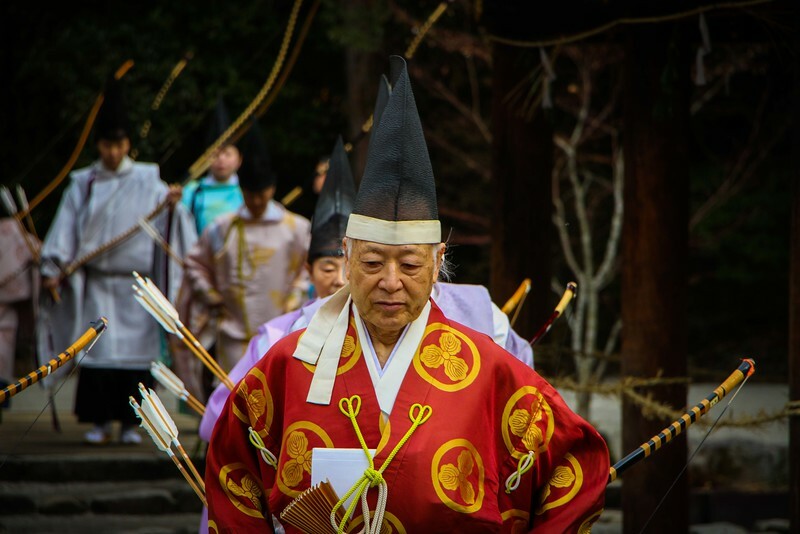 Admiring the spectacle that is a traditional Japanese archery ceremony was an amazing experience and one we’ll never forget. 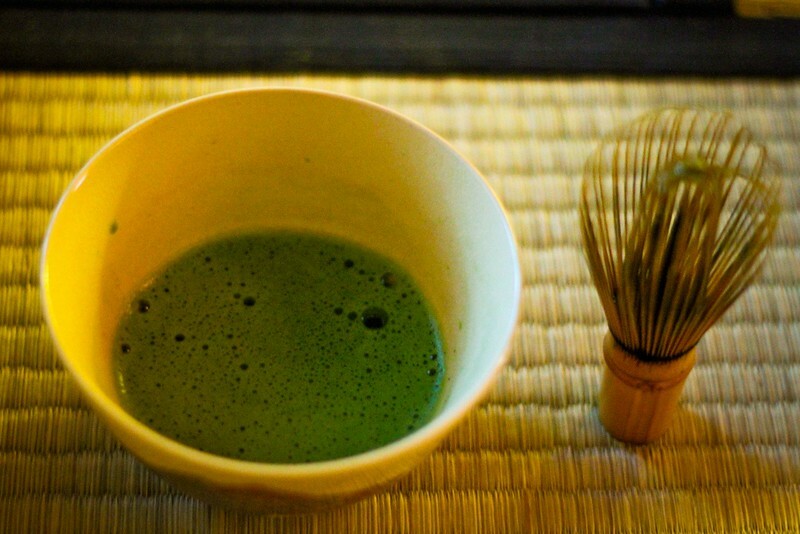 We’d highly recommend seeking out this opportunity when visiting Kyoto. 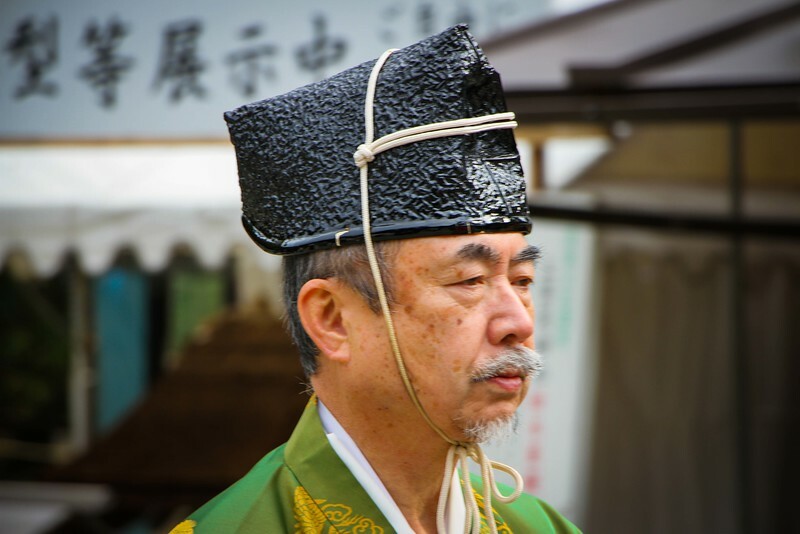 Kyoto is extremely blessed when it comes to beautiful pagodas and temples. 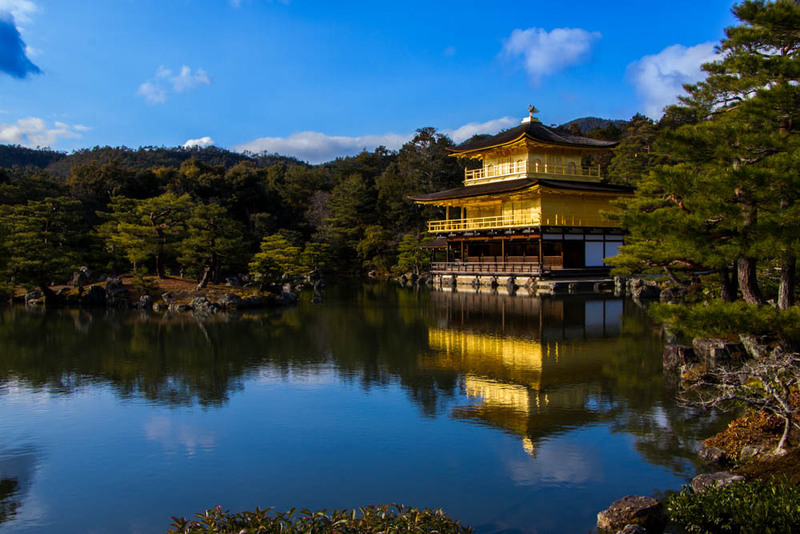 You only have to walk around the city’s Geisha District to witness many of them, but it’s also worth jumping on a local bus to explore some of the city’s best, such as the magnificent and iconic Golden Pavilion of Kinkaku-ji. We were lucky enough to witness the iconic temple on a lovely winter’s day with clear blue skies. The temple looked stunning with its beautiful golden reflection shimmering across the rippled surface of the pond before it. We could have easily admired it all day. It’s also possible to explore the area around the temple, but we’d recommend visiting in the early morning or late afternoon to avoid the large crowds. 4. Sushi & Ramen Food Heaven! We arrived to Kyoto after spending a view days admiring magnificent Mount Fuji by quiet Lake Shoji, and were excited to explore the city’s many amazing restaurants. 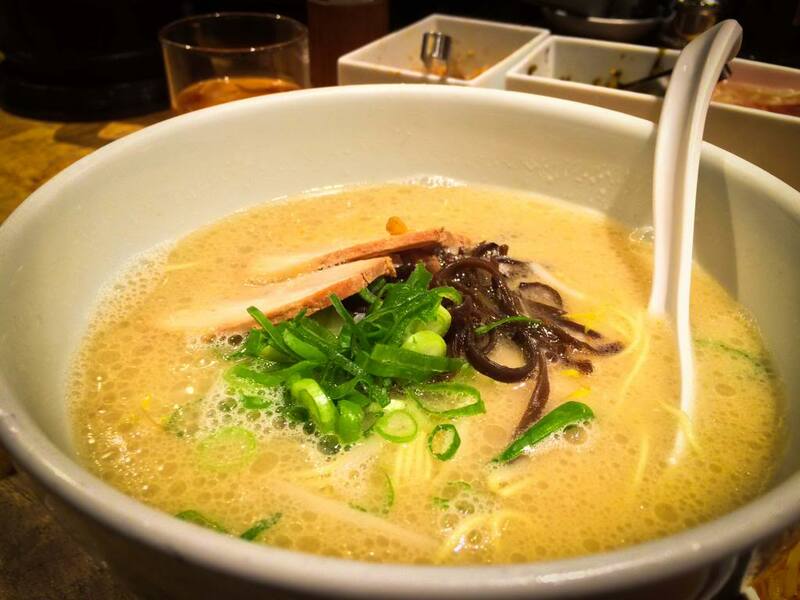 Little did we know that we’d discover some of the best sushi and ramen we’d had so far on our Japanese adventure! If you’re a food lover like us, then Kyoto’s main market, ‘Nikishi’, is also a great place to explore. Known as the best traditional food market in the city and open most days from 9-6pm, it’s a buzz of activity and a great place to see the locals stocking up on everything from delicate fish to traditional sweet treats from the many stalls. 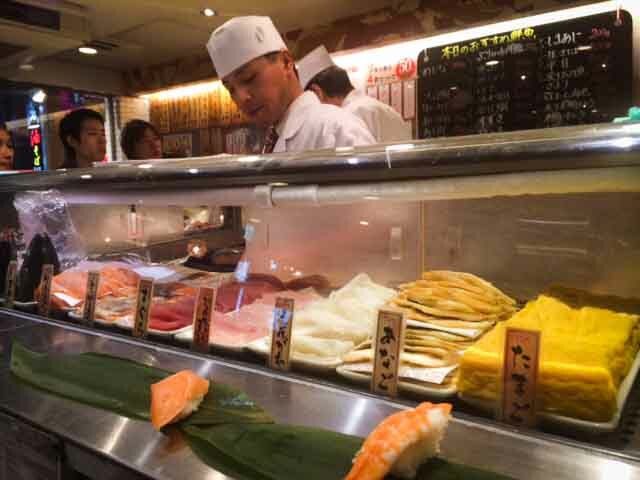 Simply grab some fresh sushi as you wander the more than one hundred shops and restaurants, it’s great fun! So that’s it! A short journey through our Kyoto highlights. 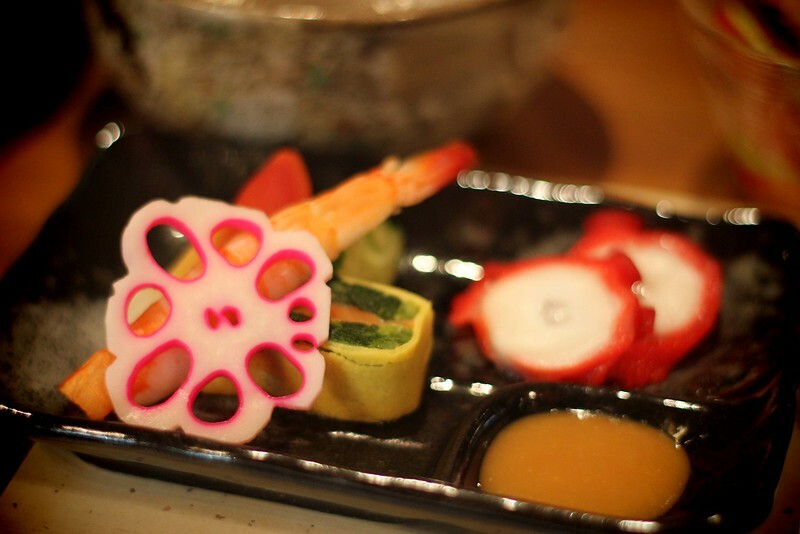 We hope you’ve enjoyed it and are feeling inspired to plan your own Japanese adventure. We can’t wait to return someday! When it comes to Asia, we always recommend the hotel booking site Agoda.com. 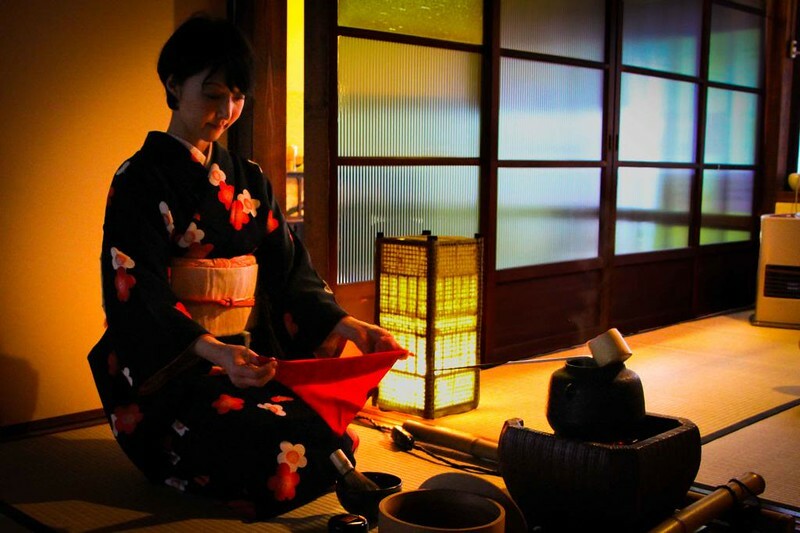 We usually book our accommodation in advance as you typically get a lower rate and the most popular spots get booked up quickly in Kyoto, especially during peak seasons and public holidays! We like Agoda.com as it offers a wide range of accommodation, from cheap guesthouses to high end chain hotels, typically with free cancellation or the option to change your dates if needs be. Plus you can book most places for free! What Do You Think? We’d Love To Hear Your Feedback And Comments Below! Pictures are amazing! Love the archery ones.